During Summer 2018 Mars is at its nearest approach to Earth and on a clear night shines brightly in the night sky. On June 19th it was cloudy when I went to bed but when I got up at about half past midnight and looked out of the bedroom window there was Mars shining in its vermilion glory in the night sky in the south east. I took the above photo hand held but using a mini-tripod on the window ledge and zooming in I got the image below which shows some surface detail. The polar cap can be seen and the dark area below it is Acidalia Planitia, just below this is a second dark area which could be Meridiani Planum or Margaritifer Terra or both! 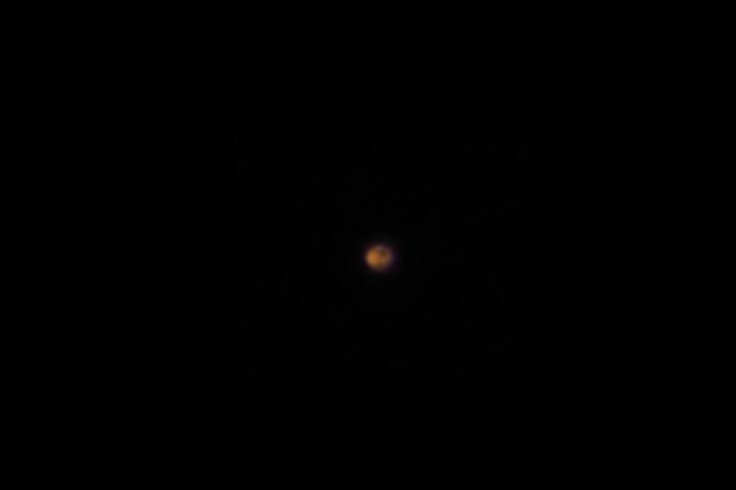 Mars is always disappointing when seen through a modest telescope or camera with a zoom lens. Its actually much smaller than Earth and probably its reputation as the Roman God of War outweighs its small size. In Henry IVth Part I King Henry says that "Thrice hath this Hotspur Mars in swaddling clothes" (Act III, Scene 2) and just in case the playgoers missed this later on in Act IV, Scene 1) Hotspur himself says "The mailed Mars shall on his altar sit up to his ears in blood. I am on fire". In a recent version of Henry IVth at the RSC Trevor White played Hotspur to Jasper Britton's Henry (Sir Antony Sher played a jolly Falstaff too). Trevor White's Hotspur was raw with rage, had little or no self control and he spoke in such a rage all his lines were accompanied by foaming spittle from his mouth. In many ways Hotspur is the opposite of Hamlet who muses much and does not act. Henry IV's Hotspur is all action with very little reasoning or logic and just bloodlust. Later on in Henry Vth Henry himself assumes the port of Mars but his going to war is more measured and in the end he is triumphant whereas Hotspur dies young at the Battle of Shrewsbury in 1403. To Shakespeare and his audiences Mars signified war. The genius of Shakespeare was in showing us that conflict may be justified as in Henry Vth or unjustified such as Harry Hotspur's revolt against the crown in Henry IVth Part I. Henry Vth only assumes the port of Mars when it is time to reclaim his French territories and is a balanced character. Harry Hotspur who was swaddled in Mars is a psychopath and knows only conflict and killing. Shakespeare uses astronomy to convey a person's nature to the playgoers in very few words which allows the play to move quickly on.